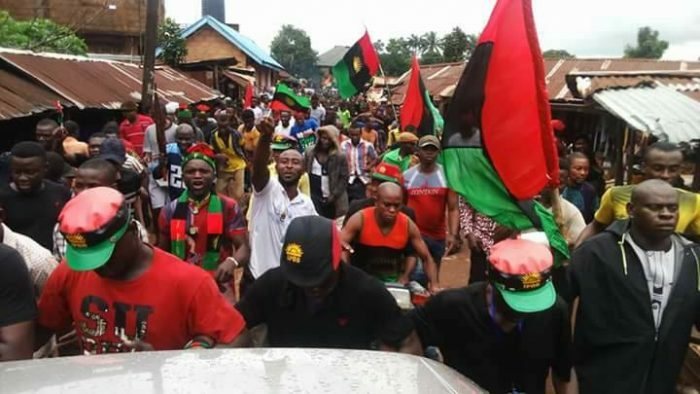 Biafra indigenous people, IPOB, and Nnewi Division police from Nigeria met on Friday at the popular Nkwo Nnewi Market. At least one police officer and one member of the Pro Biafran group were killed in the collision. Over 2,000 protesters stormed the market, with each member waving the flag of Biafran singing "no referendum, no election." The group moved and told the Igbo people in the market that they should not attend the 2019 general election unless the FG noted their request and held a referendum. However, the problem started when police officers arrived in three Hilux vans and tried to stop IPOB activities. It is said that members of the group had first raided the police, destroyed their transports, and left two policemen behind in their pool of blood.